Superb Bird Feeder Poles need to be truly squirrel stopper poles. Bird feeder poles are essentially Bird Feeder Stands. The goal of bird feeder poles should be to block squirrels and make squirrel proof bird feeders. To be a good squirrel proof pole, bird poles have squirrel baffles below to stop squirrels from climbing up the pole. A bird feeder pole has either a cylinder squirrel baffle or a cone squirrel baffle to make the bird feeders hung above them squirrel proof. Backyard Wild Birds has chosen Bird Feeder Poles that are noted for their strength, durability and are good at squirrel proofing. Below are representative examples of our basic sub-category sections of Bird feeder poles: Squirrel Stopper Pro Poles, Squirrel Proof Poles, Raccoon Proof Poles, Deer Proof Poles, Deck Bird Feeder Poles, Shepherd Staff Poles, Post Bird Feeder Poles, and Small Bird Feeder Station Poles. 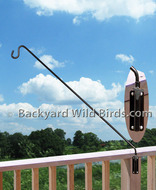 Be sure to Click on each Class to see all of the different bird feeder pole styles in their Sub-Category. 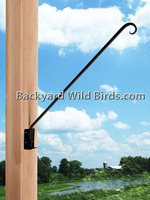 See additional info on Poles and designs to have Squirrel proof bird feeders here. Don't miss out! CLICK ON EACH PICTURE TO SEE ALL THE BIRD FEEDER POLES .